Hunting dogs help humans while hunting, as they are trained in such a way that they can easily track down a dead prey or find a live one. Training hunting dogs requires time and patience on the part of the dog owner. It must be kept in mind that training dogs for hunting is not a temporary task and requires a consistent approach. 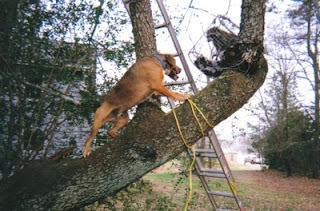 There are many types of hunting dogs and around 24 dog breeds can be trained to assist for hunting. The choice of hunting dog depends on the kind of hunt it will be used for, and the climatic conditions prevailing in the hunting area. For example, hound dogs can run at very high speeds and are used when hunting for live prey, while gun dogs are trained because they easily get familiar with gunshot sounds and are good while retrieving birds. To train a hunting dog, you first need to get one. After getting the dog of your choice, follow the tips given below so as to prepare it to accompany you for a hunt. Any form of dog training must begin early because it is easier for dogs to learn new things when they are young. 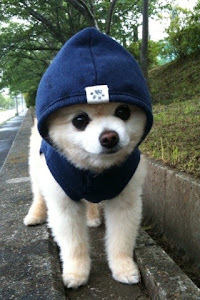 This also helps the dog owner to develop a strong, trustworthy bond with his dog. A strong bond with the owner will make the dog pay more attention to what his owner is teaching. Typically, training for hunting dogs can be started when they are seven weeks old. By beginning hunting practice from such a young age, hunting dogs become proficient by the time they mature. Start the training by teaching basic obedience commands to the dog. Use easy commands like 'sit' or 'stay' to train your dog. Once the dog starts responding to simple commands, you can start using complex commands to train it. However, it is better to find out easy alternatives to complex commands because dogs find them easy to learn, identify and relate to. Use treats to appreciate the dog each time it responds in the right way. Physical fitness is extremely important for hunting dogs. Physical training must also begin at a young age to build body muscle. Hunting dogs must have a lot of stamina to continuously look for prey and track them after they are pinned down. Exercising regularly helps in developing stamina and speed in dogs. The exercising routine must not be restricted to the hunting season, rather it must be even continued during the off-season, to prevent the dog from becoming lazy when not hunting. A hunting dog must be quick enough to identify where the prey is. Smell and sight are two ways of prey identification. Generally, dogs trained to identify smell are more capable of spotting their prey than the ones who are trained to identify through sight. To make the training easy, use a hunt-based scent so that the dog identifies the smell and tracks down the prey while hunting. If the dog has to assist in hunting deer, use deer blood to train your dog, and if it has to go waterfowl hunting, use waterfowl scent for training. Climatic conditions during the hunting season may be different from that prevailing during the off-season. So never forget to train your dog during the hunting season, so that it gets used to the environmental conditions prevailing during that season. If the dog is trained only during the off-season, then chances are that it may not perform well during the hunting season. If you want your dog to hunt for waterfowl, use waterfowl dummies that are available at the local pet store. Train well, so that it can clearly differentiate between a decoy and a real waterfowl. Place decoys at various places in the training area and throw a dummy near the decoys. 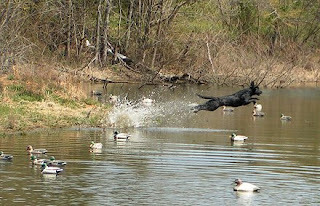 Let your dog trace the dummy through its scent and get it back without picking up the decoys. Treat your dog each time it picks the right dummy so that it can relate this activity with a treat. Training is not meant to be for a few days. Consistent training all through the dog's growing years is necessary to turn it into an expert hunting dog. 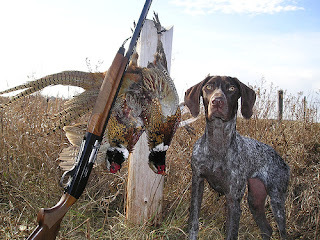 Follow a proper routine of training sessions to inculcate hunting habits in your dog. Repeating the same activity several times will help the dog to remember it well, and do what is needed if a particular command is given or a situation arises. Dogs love to make their owners happy and hunting dogs are no different. Praise your dog when it follows your instructions or completes an activity without making any mistake. 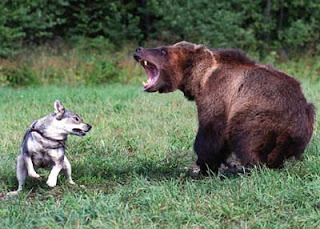 Reward your dog with treats whenever it identifies the prey correctly or does its job well. Rewards reinforce positive behavior in dogs. Your dog will do anything to please you, and it is your responsibility to love and reward it in return. 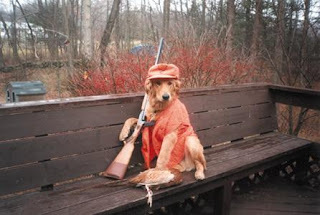 Before taking your dog to the actual hunting field, try practicing in simulated hunting situations. By doing so, the dog will perform well as a hunter during actual hunts. 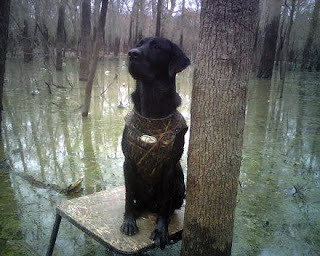 Training in restricted situations fails to provide the actual feel of hunting because of which, the dog may not perform the way it is expected. Make the training as simple and enjoyable as possible. This will help in retaining the dog's interest during training sessions. Instructing the dog using complex commands and being harsh will turn off your dog's interest in learning new things. Initially, you may find it difficult to train your dog because it may not respond the way you want. But slowly and steadily, with consistent practice, your hunting dog will learn its ways and serve you for many years with loyalty.